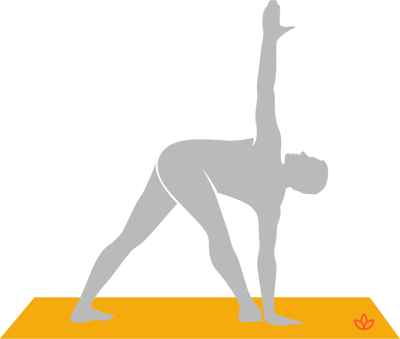 What is Revolved Triangle Pose? Revolved triangle pose, or parivrtta trikonasana, is a standing yoga posture that requires both balance and flexibility. With the feet wide, the body bends toward the front foot. One hand stays on the floor while the other lifts toward the sky in a deep twist. From standing, exhale and step your left foot a few feet back. Point the toes to the left. Inhale and reach your left arm toward the sky. Exhale and bend forward. Twist to the right and place your left fingertips on the floor outside of your right foot. Breathe while in the pose. Avoid if you have a back injury.